Managing the urban water cycle needs to be underpinned by key sustainability principles of water consumption, water recycling, waste minimisation and environmental protection. The integration of urban water cycle management with urban planning and design is known as Water Sensitive Urban Design (WSUD).One of the key elements of WSUD is the management of urban stormwater, both as a resource and for the protection of receiving water ecosystems. 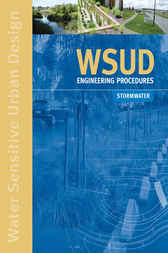 This requires strategic planning and concept designs that are underpinned by sound engineering practices in design and construction.For each of these methods the manual provides design and maintenance procedures, typical drawings, design checklists, landscape requirements, worked examples and case studies. Additional work sheets and appendices are provided on a CD-ROM which accompanies the manual.